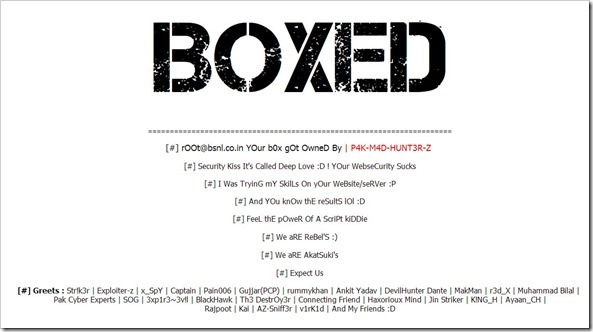 2 BSNL Microsites Hacked By Pakistani Hackers! It is amazing how often this happens, and yet our officials do not wake up to the seriousness of such things. It seems as though BSNL websites are the favourite playing grounds for hackers and script kiddies, especially from Pakistan. Every other month some or the hacker defaces BSNL websites and bask in its glory. However, more often than not, the successful hacks are not sue to skills of the hacker, but blatantly porous form of security that organizations like BSNL have on their websites. In the latest BSNL defacement, Pakistani hackers with handle “P4k-M4d-HuNt3RS” have hacked into two BSNL subdomains of BSNL – and http://vas.bsnl.co.in/. At the time of writing this piece, both these websites are showing following banner. One BSNL microsite is for their “International Roaming” services and the other is for “Value Added Services”. In this particular case, it seems that the hackers who defaced these sites do not have any particular political agenda (as is the case most often), but they are just trying out their hands at hacking. In popular lingo, “Script Kiddie” would be an apt word. What’s more, the defaced page has their Facebook page identity and they want people to follow them.. According to their FB page, the BSNL site was compromised over 16 hours back and the site remains defaced even as we write this. And as far as BSNL customers go – God save them. Recently, a much more serious news came out that Chinese company Huawei had allegedly hacked into BSNL Network and even a probe was ordered by Indian government. To add to it, with such regular hacking attempts (and successes), the personal data that their subscribers may have with BSNL, has a very high chance of being compromised. It is really sad that BSNL is not taking these incidents seriously. Lenovo, Toshiba Will NOT Offer Warranty On Products Purchased Online! May be if we bring it to the notice of Rahul Gandhi (only person in action mode) something will be done. Once again Big question raise to Indian Cyber Security and NIC admins… Who is responsible for this ..???? Vivek, Unfortunately these kind of incidents are happening far too often and like I said, it is not because of hacker’s skills… it is the porous security that our Government websites have. I am not sure when they are going to wake up… I just hope that something big on national level security does not get compromised…they will probably learn a lesson then..